More than just the cars, sceneries, drives, and destinations, that is the very charm of Tour de Cebu. Some just do it for the love of the drive, while some have touching stories to tell. Father and son enthusiasts Ramon and Illac Diaz drove their classic Volkswagen Beetle in our historic car rally and had the best road trip they will cherish forever. We now turn the spotlight to our friend Illac who shares his very memorable 5th Tour de Cebu experience with his father. These are the two things that were my father’s greatest passions. When I was growing up, I used to visit him in his office and often I thought it looked more like the images in the picture books of Michaelangelo’s studio than one that imported and exported printing supplies. There would be old English car headlights next to snake skeletons and oil paintings, which might make one think he was trying to combine man and machine. When my father was growing up, he loved to draw and sketch, but it did not fit with the growing company of J.B. Diaz and work: at that time, the family was the first priority of a business. What started out as a lunch pass to be an artist turned to fill his desk and then drawers with artworks, until finally, they spilled onto the whole second floor. My father married perfectly into a world art and cars, in a way; though maybe, precisely because of this, he would never admit it. My mother is an Italian from Brescia, the epicenter of classic car races, the Mille Miglia. My grandfather also had automobile engine oil running through his veins as the Bosch parts distributor in Lombardy, Northern Italy. There would be no shortage of inspiration for my father to sketch and visit the Renaissance masters for his other passion, art, for the region was even the source for Leonardo Da’ Vinci white marble. More importantly, it was the heart of the classic automobile culture in the country. Every year in April more than a thousand of the world’s most beautifully restored historical cars would gather at the plaza in the center of town to take off on a thousand-mile journey through the Italian countryside to Rome and back. I remember buying matching shirts, jackets and hats for the occasion. I would hold my father’s hands and promise him that one day we would travel on a road trip together. I still have pictures of this more than 30 years ago, and I have never forgotten it. Time goes by very quickly. My father grew the family, built the business, retired from business, and became the artist that he always wanted to be. With children that have grown up and finished their education, it was only right he could chase his dreams. One of those yet unfulfilled dreams was to race one of his classic cars, an old Alfa Romeo of the right vintage, those thousand miles. Slowly restored and painted, with the engine now running, all that remained now was just transport and registration. The dream inched closer until life put on the breaks to a full stop; he was diagnosed with cancer. Mille Miglia and all else were relegated to a distant second to getting better; the money saved now went to make sure the engine of my father’s health would be completely overhauled. Often I would sit while waiting for him to get out of his regular TOMO sessions at the basement of Makati Medical, thinking about that dream of father and son bonding through the Tuscan countryside and sharing our love for the automobile. I realized that we would have to get over another speed bump, one that often comes our way unannounced and throws everything up in the air. They say that when one door closes, a window opens. It was during this time that I came upon an article on Facebook about a thousand-kilometer classic car race right here in the Pacific Islands of the Philippines, the Tour de Cebu. The title was even more intriguing: “the best tropical rally you have never heard about.” The pictures showed amazing images of Porsche’s, Triumphs, Cobras and other beautifully loved classics running through the islands with smiles only true petrol heads would understand when there is a perfect bonding of man and machine. I reached out to the organizers and discussed the potential entry of another classic heirloom, a Maserati Gran Turismo, probably the only one of its model in Southeast Asia. I started discussing the ongoing restoration with the prayer that it be finished on time. Then disaster as it looked like a remote possibility. Unfortunately, with the expenses from his health concerns, my dad had to postpone the restoration of his Maserati. However, over the last seven years, I have been restoring a classic family heirloom in the form of a 1953 Volkswagen convertible that my grandfather bought many years before. An importer of German printing machines, primarily Heidelberg off-set, and true to form to any Pinoy, my Lolo would see any free space and would look for an extra item to stuff in them. In this case, it was a Beetle that fit into a 40 footer. Without the bumpers, it probably would have fit in sideways. It was listed as the first imported Volkswagen in the country and still carries the #5 badge of the Volkswagen Club of the Philippines. The Bug began as an extra car for the household, then started to be the school bus for my Lolo’s 12 children, including the future Miss Universe, Gloria Diaz. This was surely a sight to behold, like a magician’s hat, only instead of rabbits, out came several children and their backpacks to go to school. In the late afternoon, they would pile back into the Bug and disappear into the strange curved car in the middle of a sea of the American cars that were the fashion at the time. So different was the first beetle in the country, that people would shout PAGONG (turtle in Filipino.) The car became my father’s during his teen years, where he was given the name “The Lone Ranger” for his trademark departure from his parking space in Letran. His classmates grew more aware of his offer to have a free ride home when they ended up having to push the car. Since my father could not fix the starter, it had to be pushed while he jumped in, running to put the clutch into second gear for the forced start, like the Lone Ranger as he jumped on his horse to ride into the sunset. The Volkswagen’s 1100 engine kept on going through the years as the Diaz family grew, with its reliability never in question. As the times changed and faster and faster Japanese cars started coming into the country, the VW started to be used for the sharpening business as a mule, carrying heavy blades to clients such as newspapers and packaging, like the characters in CARS, one of those Disney movies. Finally, it wore down to a halt, as even German bearings get worn down, and it was tucked into the back of the warehouse. It was in my teens that I discovered the Volkswagen with no floor or roof behind stacks of paper which, if not brown with rust, would not have shown so clearly against the sea of white almost completely covering it. This strange car with bulging eyes and bulbous shape started my lifelong love interest in restoring cars, but especially, a love for Volkswagens. Having the Volkswagen of my father’s youth newly painted was perfect, but also the 1100 engine was completely restored. 2018 also marked the last year that the Volkswagen Beetle, a design largely unchanged since 1935, came to an end in production. I wrote an appeal to the organizers for consideration of our old Beetle, especially calling attention to its historical significance as well as the opportunity to fulfill me and my father’s dream. Chris Tio, the Grand Marshal gave me a call and we discussed the situation. A few more discussions over the next few days soon cemented an exemption. Excitedly, we sent in our application online and within a week got a friendly call to explain the shipping details to Cebu and back and the schedule of events starting on November 15. Immediately concerned about the heat a trip like this would take on my father, I installed a fabricated blower under the dash (built by Rhodel) to be sure to keep my father cool so he could finish the trip. In the midst of so many British and American cars, I thought it best to swap out the classic half-moon tires with chrome hubcaps for some original dusted out EMPIs, and put some wired stone guards on the headlights and plate for the back fender, since, as someone who has briefly passed by Bohol, I thought there would be some rough roads. Everyone can find a way to make it, and it depends on your budget (and time.) There are budget options where cars from Manila could be brought to the starting point door-to-door. A flatbed would come straight to your house, put it on the container, and bring it right to the parking slot in Mo—Cebu. You would just need to arrive with a backpack. I chose the budget option and drove the car to the cargo terminal, which ended up being farther than I thought, next to Smokey Mountain. If you thought traffic with cars was strenuous, you have not yet gotten caught in a small taxi with a lorry towering over you at every corner, bringing home the possibility that you could be crushed like a small soda can with a second’s loss of attention (or sleepiness.) After some paperwork, the car slid into the blackness of the 40-foot container and would appear a few days later, ready to start a new reincarnation as a Tour de Cebu rally car. My father was so excited to be in his old car that he spent some nights painting an old suitcase and putting stickers that he downloaded and printed to add to the touring look of the Bug. Till now there seemed to be a red carpet walk for the Diaz father and son team, but on the day of departure, as the best-laid plans of mice-and-men go, we began to have some difficulty. Until that point, the preparation for the Road trip was a solo affair, but on the day of the race, with a full tank of gas, two grown men, a luggage of clothes for three days, and liberal snacks and water provisions, we had pushed the front wheel to the fender but the car could not even back out of the parking lot. After so much money for the registration, the round trip flights and the hotel, we had not even made one meter of the 1000 kilometers. This poignant image was even worse with the cars and their proud upbeat owners in full regalia starting their engines to begin the trip to the ferry; and the starting point in Bohol. Where there is a Volkswagen, there is a Volkswagen family. Immediately sending a shout out for the Cebu Chapter of the Volkswagen Club of the Philippines, we were able to meet Byron Pyramide who not only loved but restored Beetles. The diagnosis was that we had to trim the fender an inch, and there was a little bit of a murmur in the carburetor. Since it was late in the day, Byron would lend us his from his engine. Everything else was functioning well, fortunately, and although we would miss out the starting flag, we still could catch the second ferry to make the tour. The Diaz men were still in the race. It really was like the series for the Amazing Race. Finally fixing the suspension, we caught the last ferry and took off late. There was one more challenge that we didn’t see coming. We had been in the race for a couple of hours. I was at the wheel and my father was the navigator. He had attended the briefings as he took an earlier flight and took all the notes and the packets so I assumed he was prepped. We seemed to be going well for hours, as we were following a yellow Morris through the turns and straights of the island roads which turned out to be some of the most beautiful I have driven through in the country. Then I started noticing that two hours after we started that we were not passing any checkpoints to stamp our times. I leaned over to my father and asked him about the Google Maps on the phone and if we were on the right road, to which he looked over and said quizzically, “But Illac, I don’t know how to follow the map on the phone! I am following those guys that seem to know what they are doing as they have the full leather race helmets and googles“ Looking down at the screen, I noticed that we were the blue dot five kilometers from the race route. Slowing down, I move to the side to check and there my father admitted that he had never used Waze and Google Maps which was strongly confirmed when he pointed to the red pin (our hotel) and asked if this was us. The guys in the convertible yellow streaker were obviously also lost but seemed to be deliriously happy to just speed along hoping that in an island you will eventually cross the right road. At that moment Tio, grand mast shall perform sweeper duties in the brand new Jaguar 4x4, stopped beside us having looked for our entry as we were one of two that did not pass by his checkpoint. Since the day was late, he offered to bring us to the hotel where we could wait for the others with a cold drink in hand. Not a bad idea after the other vehicles was already at the other end of the island and it had been a cloudless day. The evenings were full of delicious food, music, and good-natured jokes; a genuine gearhead community party that spilled into the parking lot. There, mechanics and owners would discuss troubling sounds, overheating, wiggles, spark plugs and belts and some as far as one engine were in of the middle getting brain surgery through the night. Even the cars seemed to be chatting with one another; roars of engines would mix with laughter and conversations. With support from the local government, some of the best performances would come to entertain us, including a 25 piece band that truly left an unforgettable impression dancing with precision and playing their instruments at the same time. Breakfasts are the best times on the Tour de Cebu, where navigation and preparations happen and everyone is present. My father loved trying to sit with different groups every day and I loved to see how he could start a conversation with anyone; before long, he knew everyone. The second day I was the navigator, and my father the driver. Although at first I was worried that the heat would get to him and made sure we had the roof up and the blowers on full, soon as he was behind the wheel, and my fear was misdirected. He sat down and owned that car, put the roof down and took off of the starting block at full throttle. I often looked away from the digital map to appreciate the sportsman, car lover, and adventurer that I was slowly getting to know with each kilometer. This was not the calm man that was a temple of calm in the Manila traffic. My father was carving those mountain roads and overtaking participants with such zeal that I had to remind him sometimes that this was a friendly race. So enthusiastic was his heavy foot that often I had to run back a hundred meters or more to get the stamp. He would be so into driving that even when it started to rain, he would ask me to put up the roof while moving to save time. Spending the whole day racing with my father in his old car was like a time machine for me to spend time with him during his younger years, as I often have seen him sedentary in his studio. It was wonderful to see him recognize almost all of the vehicles as he would call them out as we passed them, or in the parking lot where he would tell of his adventures that he never told me before. It felt like I was discovering a new side of him as each kilometer sped by. The third and last day I woke up early and my father was already out and about with his new friends and preparing the car. Between laughs and revving the Volkswagen to rival that of the Porsche 356, I felt that this oil and old metal atmosphere was the fountain of youth and that all this time with my father was like sitting in a time machine to travel together as he would have with a best friend. Today’s agenda was a photo shoot of all the cars together and then a ride to the port back to Cebu where the next day would be the awarding at the Montebello Villa Hotel. We all lined up at the Bridge between Panglao and the main island of Bohol. What started with a few drivers from Manila, including my father and I, was now a larger community of the Tour de Cebu family. My father did not seem to get the notice as we were driving through the street on the way to the port. He seemed to be racing, and even later we were told that the Bacolod team’s Mercedes-Benz commented on how they had a hard time catching up. After a final photo shoot of TDC Class of 2018, we rode our steeds into the Fast Cat for the mainland. The ferry landed in Mactan island back in Cebu a bit late, and after shuffling off the ship, we took the Beetle back to the hotel, and we were knocked out before even touching the pillow of the bed. The next day we wore our matching white Bermuda hats and shorts with Hawaii-inspired large polos so artfully designed that the particular genius escapes me. Everyone was in high spirits and the hearty breakfast replenished our strength. The awarding ceremony started and the best racers were given beautifully designed trophies where recycled pistons were creatively used as pedestals. 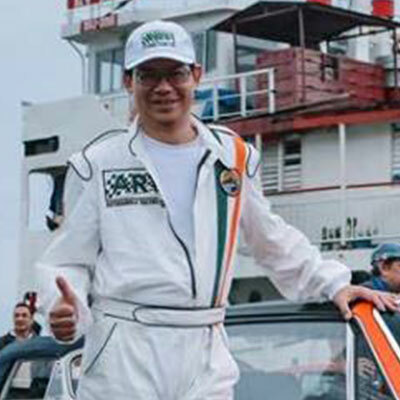 The smiles of the winning racers were as shiny as the newly cleaned automobiles that were crowding around outside the hotel; the biggest was the winner Lui Alvarez and his navigator Justin Neri who nailed the checkpoint times and finished every day with a perfect score. However, just as the final clap subsided, my father and I were unaware that there was one more surprise to come. The Gentleman Driver’s trophy was announced, and my father was called to the front to be recognized for his years of passion for the classic automobile and its preservation, but also as being a comrade to everyone during the 2018 Bohol rally. My father’s face was akin to finding a rare vintage part for his collection with thousand-watt headlights beaming from his face. This was truly a great honor for a man who has gone through so much and is still a warrior who survived through cancer; an amazing father, car collector, and a man who has rallied in life and in TdC to be a celebrated as a true example of a life well lived. TdC for my father and I was truly one family road trip to remember. Forever.